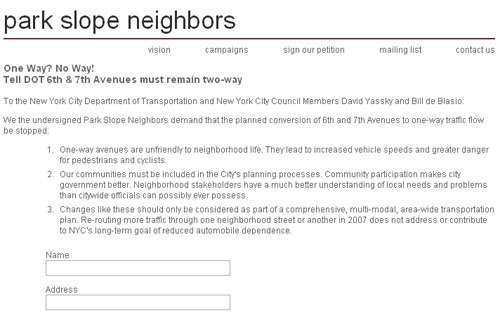 Park Slope Neighbors, which is working to convince Whole Foods to make its Gowanus store more environmentally friendly and sensitive to community needs, has launched a petition drive to oppose the plan to make Seventh Avenue and Sixth Avenue one-way streets. The development is reported by Streets Blog. Among other things, the petition argues that "One-way avenues are unfriendly to neighborhood life" and that "changes like these should only be considered as part of a comprehensive, multi-modal, area-wide transportation plan." The full petition can be viewed online and signed here. Volunteers have also been out in Park Slope gathering signatures. New Blog Alert #1: Bed-Stuy Blog! Has Thor Smoked Coney's Grill House?